Based on the novel of the same name (and how could it be anything different?) by Mary Ann Shaffer and Annie Barrows, The Guernsey Literary and Potato Peel Pie Society is a lightweight slice of rose-tinted nostalgia filtered through the lens of modern movie-making techniques, and with even less substance than the culinary creation in its title (which sounds like a stodge-fest of epic proportions). It’s by-the-numbers movie making with no surprises, an ending you can guess all the way from the rings of Saturn, and as many softly poignant moments designed to raise a tear that can be squeezed into a two-hour run time. It’s cosy, and reassuring in its approach, and it requires almost no effort at all in watching it. In short, it’s a perfectly enjoyable confection that’s written and directed and performed with a keen understanding that it has to be made in a certain way, and that way is to provide audiences with the cinematic equivalent of comfort food. So lightweight is it that the mystery of Elizabeth’s absence isn’t even the most dramatic aspect of the movie – and that’s bcause there’s nothing dramatic about any of it, no matter how hard the script tries, and no matter how hard its director tries also. Thankfully, all this doesn’t mean that the movie is a bad one, just predictable and bland and almost a perfect tick box exercise in terms of it being a romantic drama with a wartime background. It does feature a clutch of good performances, with James suitably bullish and radiant at the same time, Courtenay delivering yet another example of his recent run of lovable old codgers, Goode effortlessly suave and supportive as Juliet’s publisher, and Powell as the boyfriend who you know is going to be dumped near the end to ensure that true love prevails as it should. Only Huisman looks out of place (and there’s a distinct awkwardness and lack of chemistry between him and James), while Parkinson and Wilton deliver pitch-perfect portrayals of a gin-making (and swigging) spinster, and a still grieving mother respectively. It’s handsomely mounted (though sadly, none of it was actually shot on Guernsey), with impressive production design and period detail, and equally impressive effects shots detailing some of the destruction suffered by London during the Blitz. But still, there’s that traditional romantic storyline that anchors the movie and keeps it from straying too far into original territory. And if there’s one thing that the movie knows above all else, it’s that familiarity – when done correctly – is all you need. 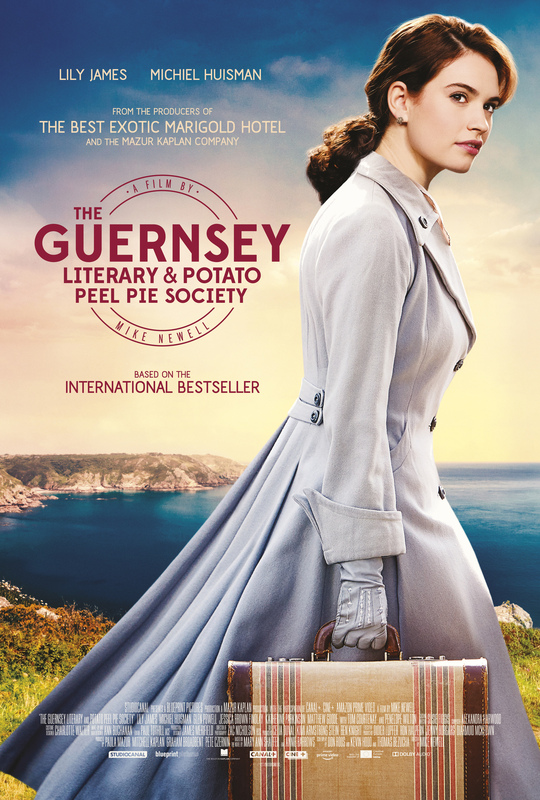 Rating: 7/10 – a movie that can be criticised easily for what it doesn’t do, The Guersey Literary and Potato Peel Pie Society is a modest movie with modest ambitions, and likely to have a modest effect on its audience; a good-natured bit of celluloid fluff, it’s perfect viewing for a wet and windy Sunday afternoon, or when all you need is something that doesn’t require too much effort in order to enjoy it fully.